Earn $4.18 in VIP credit (418 points)What's This? Michelin's Protek Urban Tire delivers a quick rolling tire that still grips in the wet. It's designed with a rubber compound based off the one found in their PRO4 Grip road-cycling tire for optimum traction in all conditions, and the aramid puncture protection layer prevents foreign objects from causing untimely flats. Features a reflective sidewall for enhanced visibility. 26" x 1.85" dimensions. Built with a non-folding steel bead. Claimed weight of 700 g.
High high PSI, low low rolling resistance. I use these for city commuting on an old rigid-fork mountain bike. I switched from Michelin Country Rock tires that have an asphalt friendly tread but aren't this smooth. The improvement in rolling resistance with the Protek Urbans was obvious. The Protek Urbans take 87 psi, which is astounding for tires that are nearly 2 inches in diameter. There are probably a few other 26 inch tires out there that can hold that much air, but I haven't seen them. Good grip, sturdy, and like the reflective strip. I put a pair of these on a motorized bicycle that I built from the frame up. I've finally changed the rear tire after nearly 4,500 miles, the front shows very little wear. I must say that the only time I've ever had a flat is on the rear tire when I pick-up a large nail. I'm extremely pleased with this tire because they grip so well and have such low rolling resistance. They are worth every penny at the MSRP... and are A STEAL when they're on sale! Needless to say, I will never use ANY other tire for my bike. 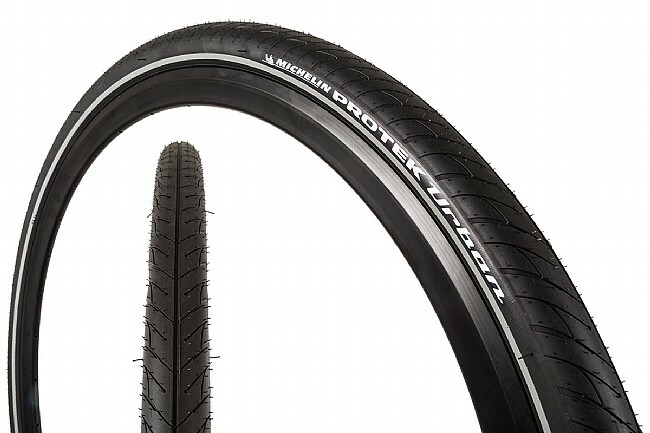 I put these on a mid '80's rigid MTB for commuting, and they cut my commute time considerably. Probably just due to the higher operating pressure, but I'll take it. I also like the way they fire out the occasional rock with a very satisfying 'ping'. Fast Tire, very low resistance, smooth ride. Used this tire to convert a MTB to a school commuter. The bike became sooo much easier to pedal. Have not tried in the rain yet but the tread design looks like it will do well. Coupled this tire with the Proteck tube in the hopes I won't need to carry extra parts.